Your toothbrush and deodorant are in a box marked Basement Storage, your great-grandmother’s heirloom china is in pieces, and you’re in your husband’s underwear, making Hamburger Helper in a Little Tykes plastic frying pan in the microwave. You’ve just moved. Could things get worse? Probably. But then they’ll get better, especially if you can see the humor in that hare-brained, heartbreaking and hilarious thing called moving. 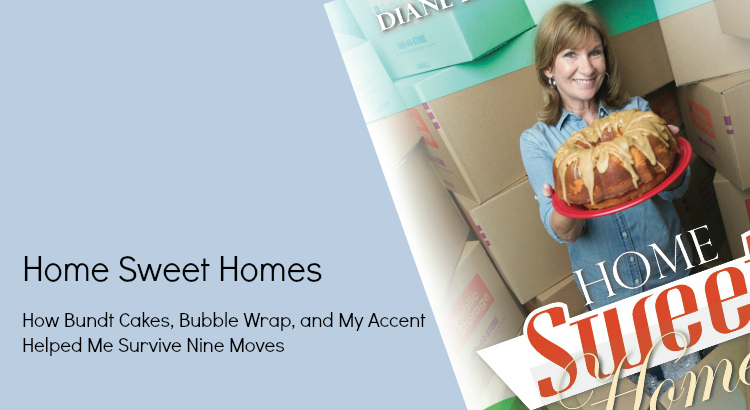 Home Sweet Homes: How Bundt Cakes, Bubble Wrap, and My Accent Helped Me Survive Nine Moves takes you along on Diane Laney Fitzpatrick’s cross-country moves with colicky babies, sulky teens, dogs, frogs and goldfish. With 42 Moving Tips and one hilarious story after another, Home Sweet Homes is a side-splitting survivors guide to moving, that is sure to keep you laughing throughout life’s moving moments. If you would like an autographed copy or book signed to someone special, order directly from the author. Please include all information I need to know in the Write a note to the seller field at checkout. Realtors! Home Sweet Homes makes the perfect client gift! Real estate and relocation professionals get a 20% discount on the purchase of five or more copies of Home Sweet Homes, when ordered directly from the author. Select ‘Realtor Discounted’ on the online store. Home Sweet Homes is a fun selection for your book club. If ordered through the author, you’ll get a 20% discount on 10 or more books for your next book club meeting. Diane will join you via Skype, Zoom or Google Chat to talk about the book. It’s no Great Expectations but that’s kind of the point, isn’t it? Select ‘Book Club Discounted’ option on the online store. Home Sweet Homes is in 12 libraries throughout the country. The Kindle version is part of Amazon’s lending library. Check it out – literally – at Amazon. If you’d like Home Sweet Homes in your local library, tell Diane, and she’ll donate a copy to any library who will have her. Diane will send you a free chapter of Home Sweet Homes if you ask her nicely. Or go to this page.